14 Jan 2019 --- Higher intake levels of dietary fiber and whole grains are being linked with a lower risk of non-communicable diseases, body weight and cholesterol levels, according to an extensive analysis published in The Lancet. The research highlights the importance of carbohydrate quality in our diets, which may be particularly salient as low carb diets continue to trend. “We understood fiber to be good for us, but we didn't realize just how good it is,” study author, Andrew Reynolds of the University of Otago, New Zealand, tells NutritionInsight. Fiber is set to be a huge trend in 2019, with consumers knowledge around its benefits increasing and manufacturers engaging in fibrous NPD. Innova Market Insights has tipped “A Fresh Look at Fiber” to be a key trend this year. According to a consumer survey (2018) conducted by Innova Market Insights, 44 percent of US consumer are increasing their consumption of fiber, with 33 percent of UK consumers doing so. At the same time, 21 percent average annual growth has been reported in new product launches carrying a fiber claim. While dairy is still by far the largest category for digestive health claims, growth is very modest globally, with just 0.3 percent growth reported in terms of CAGR from 2012 to 2017. The fastest growing area is baby & toddlers nutrition at 19 percent, while soft drinks has been heavily driven by the rise of products such as kombucha. Sports nutrition is also strongly on the rise as the benefits of probiotics and performance begin to trend and more scientific support emerges behind their role in boosting performance. Researchers included 185 observational studies containing data that relate to 135 million person years and 58 clinical trials involving over four thousand adult participants. They focused on premature deaths from and incidence of coronary heart disease, cardiovascular disease and stroke, as well as incidence of Type 2 diabetes, colorectal cancer and cancers associated with obesity: breast, endometrial, oesophageal and prostate cancer. The authors only included studies with healthy participants so the findings cannot be applied to people with existing chronic diseases. The findings suggest that a daily dietary fiber intake of 25-29g per day results in the greatest risk Click to EnlargeInnova Market Insights has tipped “A Fresh Look at Fiber” to be a key trend this year. reduction across a range of critical outcomes, including cardiovascular diseases, Type 2 diabetes and colorectal and breast cancer. Similar findings for whole grain intake were observed. Lower body weight and cholesterol were also associated with higher intakes of fiber and whole grains. The results further suggest that a 15-30 percent decrease in all-cause and cardiovascular-related mortality, when comparing people who eat the highest amount of fiber to those who eat the least. Even the researchers themselves were “surprised by the number of non-communicable diseases and mortality from those diseases that high fiber diets could help prevent,” according to Reynolds. For every 8g increase of dietary fiber eaten per day, total deaths and incidences of coronary heart disease, Type 2 diabetes and colorectal cancer decreased by 5 to 27 percent. Protection against stroke and breast cancer also increased. Furthermore, for every 15g increase of whole grains eaten per day, total deaths and incidences of coronary heart disease, Type 2 diabetes and colorectal cancer decreased by 2-19 percent. Higher intakes of whole grains were associated with a 13-33 percent reduction in NCD risk – translating into 26 fewer deaths per 1,000 people from all-cause mortality and seven fewer cases of coronary heart disease per 1,000 people. Whole grains are high in dietary fiber, which could explain their beneficial effects, the researchers point out. The study was commissioned by the World Health Organization (WHO) to inform the development of new recommendations for optimal daily fiber intake and determine which types of carbohydrate provide the best protection against non-communicable diseases (NCDs) and weight gain. “Our findings provide convincing evidence for nutrition guidelines to focus on increasing dietary fiber and on replacing refined grains with whole grains. This reduces incidence risk and mortality from a broad range of important diseases,” says corresponding author Professor Jim Mann of the University of Otago. 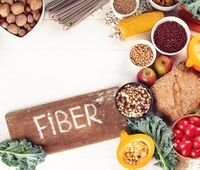 Current consumption of fiber in the UK is below recommended guidelines, according to a Public Health England survey from early 2018 that found that only nine percent of adults were achieving the daily intake goal of 30g. The authors contemplate how the health and nutrition industry may take heed of the findings, especially since low carb diets, such as keto and paleo, continue to be on trend. Although carbohydrates are still consumed when following such diets, they are often found to not be of a sufficient, fibrous quality. “It would be nice if there was an increased awareness that carbohydrate quality is an important consideration in our diet. A lot of people still get caught up on reducing carbohydrate quantity without realizing that sugars, starches and fibers are all carbohydrates, each with their own impact on digestion and health,” says Reynolds. “Our research indicates that we should have at least 25-29 g of fiber from foods per day. Most of us currently consume less than 20g of fiber per day, which means that we still have a way to go. Practical ways to increase fiber intake is to base meals and snacks around whole grains, vegetables, pulses and whole fruits,” he adds. Regarding further research, Reynolds notes that the role of fiber and whole grains in the management, as opposed to prevention, of disease is warranted. An investigation into foods which have been fortified with fiber would also prove to be useful as the study mainly relates to naturally-occurring fiber-rich foods rather than synthetic and extracted fiber, such as powders, that can be added to foods. “Our evidence is primarily on the fiber in foods, so we can't say that fiber added to foods has the same health benefits. Processed foods that have fiber added may also have added sugars, added saturated fat and added sodium. So I'm very interested in foods being promoted when they have proven health benefits, and preventing the promotion of more manufactured foods that don't necessarily confer the same benefits,” explains Reynolds. A 2018 study found that adding highly refined fiber to processed foods can have adverse effects on human health, such as promoting liver cancer. The researchers at Georgia State University and the University of Toledo note that the findings should lead to caution in enriching processed foods with fibers. This is especially in light of the FDA ruling from June which will encourage the marketing of fiber-fortified foods as healthy. However, in response, fiber suppliers did point out that this was an animal study, thereby questioning its applicability to humans.